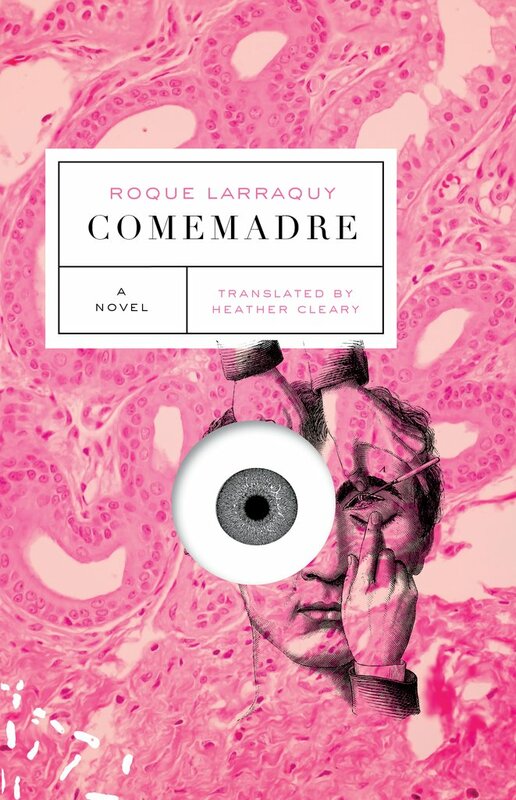 Roque Larraquy’s Comemadre is a short novel about heads and about bodies. It explores the fragile space between life and death, unveiling the alienation inherent in both. The throbbing pulse of the book, which ties together its many disparate and overlapping narratives, is a confrontation with the ways that self-realization can also lead to violence and the objectification of others. The book is split into two primary narratives. The first takes place in Buenos Aires, 1907, and focuses on Doctor Quintana and his associates at the Temperley Sanatorium. Quintana is a character of considerable nuance, difficult to classify, in equal parts admirable and horrifying — a truly human portrait of a complicated individual. The Sanatorium’s owner and founder, Mr. Allomby, is interested in the notion that a head, once severed from the body, can survive for up to nine seconds. He tasks Quintana and the others with the seemingly impossible job of capturing these moments between life and death and interrogating them. Bypassing any semblance of medical ethics, they engage in a series of depraved experiments in search of answers and personal achievement. They focus on beheadings and attempt to extract from these severed heads nine second prophecies into the afterlife. I’ve just told him that I think it might be necessary to ‘review — for lack of a better term — ethical aspect of the experiment, in the hope that . . . ’ and I feel an urgent need to erase my mouth, grab a scalpel and cut myself a new one, and then start over. As suggested by this dialogue, the novel is not concerned with excoriating particular bad actions, and it would cheapen the text to read it as a mere dystopian warning against particular medical experimentation. The doctors’ cavalier attitude toward their patients’ potential suffering and their willingness to experiment with human bodies illustrates Larraquy’s broader conviction that our capacity for violence is more readily flexible than we like to believe. As the doctors carry out these experiments, they are competing for position within the Sanatorium’s hierarchy. But they are also contending for the affections of head nurse Menéndez. The pursuit of Menéndez in many ways usurps the more fantastic elements in this first section of the book. Her fate becomes immediate and crucial to the reader. Larraquy achieves this effect by granting access to the grandiose internal narrative of Quintana and his maddening desire for Menéndez. Her story, much like the novel itself, borrows from different genres depending on the particular situation. At times it reads like a romance and, at other times, like a thriller. In the end, her fate is little different from that of the patients in the Sanatorium. Both she and the patients are made objects of the doctors’ insatiable curiosity, and everyone suffers for it. The novel then jumps forward one hundred years. This second portion is almost entirely composed of a letter written by an Argentinian artist to an academic who has taken an interest in his work. The artist’s work is unveiled slowly and considerately through the story of his childhood and development as a prodigy. In a series of artistic concessions, the artist engages in extreme manipulation and transformation of his body. Our artist encounters his doppelganger, who so happens to also be an artist, and the two begin working together. The first modification our artist makes is to cut off his finger and hang it as part of their first joint exhibit. Modifications continue and become central to their work, eventually leading the artist to undergo surgery that will erase any slight differences between his face and the face of his look-alike. Many of the same themes are picked up anew in this second section: a focus on the body, the pursuit of sexual acceptance, and the ways that an unerring pursuit of a thing can, in fact, pervert the thing it pursues. Despite differing significantly in plot, the two sections of the novel are brought loosely together at the end, looping the mirrored themes through one another and leaving the reader with something akin to resolution. Maintaining separate storylines throughout the first and second half of the novel is a unique facet of the text. Despite the scattered details and shared histories that eventually links the two narratives, there is very little in the plot that directly connects them, and their linkage relies on a thematic ascent. The polyphonic quality that results from the narratives sharing the same title enhances the sense of programmed disorder Comemadre naturally induces. The book is unsettling in its depiction of severed bodies, merciless characters, and ominous dreamscapes. Creating this sense of disturbance seems to be a part of Larraquy’s artistic intent. By unmooring the reader, he creates a reading experience that allows for shock in the face of violence, an increasingly difficult task for an artist. Juxtaposing two disparate stories allows the form to match the disconcerting content. I stand so my feet are aligned with hers. Must I approach her now, or do I have some time to spare? Time it is. One of my shoelaces extends across the room, laces itself through her shoe, inches up her uniform, wraps itself around each of her buttons, and ties itself in a delicate bow at her neck. If I gave a good kick, those buttons would go flying. As it is in this scene, the absurd is planted and buried throughout Comemadre, creating a sense of constant doubt and uncertainty. The writing is sparse and evocative, even as it takes considerable risks. The effect accomplishes a great deal in short spaces. By tempering even the darkest of moments of the story with grand metaphors, scathing interiority, and the comically absurd, Larraquy pulls the rug out from under the reader’s despair, humanizing the seemingly inhuman cruelty of its characters. It’s essential that the story feels empathetic and relatable if Larraquy is to effectively raise questions of cruelty, alienation, and guilt. The comedy of the text allows the reader to form a certain kinship with the characters, while their increasing cruelty forces the reader to reckon with the centrality of violence in the lives of these deeply human characters. 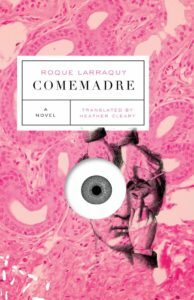 Comemadre is a story about the limits of science and discovery, about the purpose and process of art, about the dangers of the unchecked male ego, and much more. Beneath each of these distinct intentions, though, the book is not fundamentally theoretical, but relational. Larraquy imagines a complicated world of webbed human bonds that span generations. Each of these bonds is pulling on another, creating unique tension, unique threats, and unique possibilities. Larraquy’s scientists and artists attempt to uncover their true natures on both personal and existential fronts. In the process, their desire to be validated and accepted by others becomes all-encompassing. As these relationships carry the narrative and take center stage, it becomes apparent that guilt and desire can easily transform into violence once acted upon. The profound tragedy suggested by Comemadre is that in the absence of extended validation, that validation is too often stolen by force. At the book’s fundamentally relational foundation, Larraquy demonstrates that the tenderness which results from shared vulnerability is often undergirded by a violence springing from the same source. Stephen Mortland lives in Indiana. His fiction has appeared is forthcoming in XRAY Literary Magazine, Expat Press, and Faded Out. His reviews have appeared or are forthcoming in CLASH and Necessary Fiction. You can find him online @stephenmortland.